Well, many apologies for not updating this earlier – I actually have lots of updates, but have just not gotten round to sitting down and writing something! 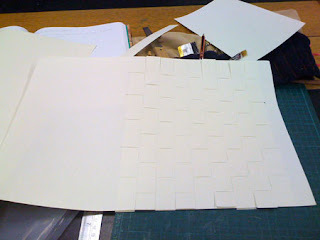 So I will start with what we are working on at the moment in our studio time (Fridays). 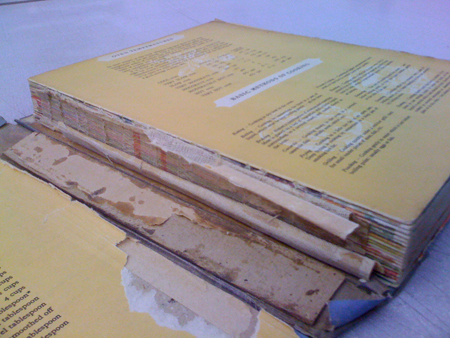 We have all been asked to bring in dilapidated books, preferably ones that require re-sewing. Togther we’ve brought in a range of interesting books, mine is actually something I had on my bookshelf at home already. 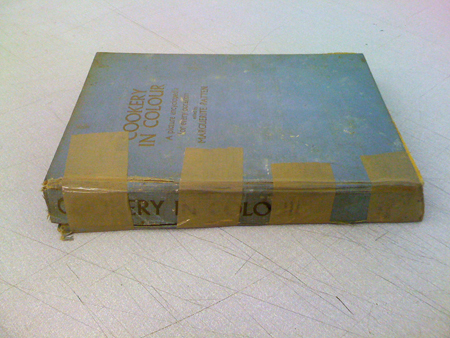 It is a cloth case bound book that belonged to my grandfather – a very colourful cookery book from the 60’s/70’s, which I rescued from a clear out some years back with the thought of conserving it, so am quite chuffed I’m actually getting round to doing it! 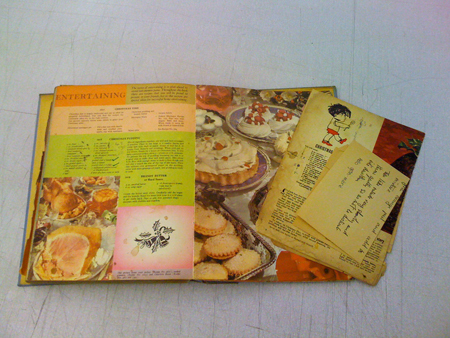 Some pictures below show the book as it looks like in its current state, it also has a lot of little inserts in it with my grandparent’s and mother’s writing, which is quite entertaining! Nice and neat if I do say so myself! 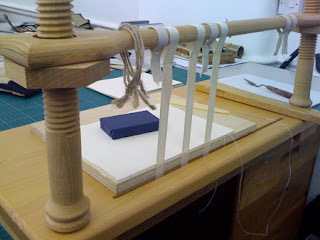 As you can see I have been practicing using the sewing frame, which I’m starting to love a little bit – I’m not quite used to sitting sideways as they did in days past, as I can’t get my arm round the frame properly, however I’ve seen an etching of women sewing with their arms through the frame, which seems a lot more logical – so I might try that next! 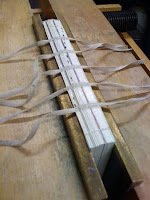 One of my classmates, Salvador, also told me that book sections were sewing in large batches on long stretches of tape, and then split up after sewing into separate books – so that’s some thing else to try! I’ve also been practicing my marbling (again!!! ), with a little more success this time – thanks to another classmate, Naomi, who has given me some Carragean moss for the ink to sit on, and some good instructions (previous attempts were so shameful, there were demoted to making cards!). So I am going to try and cover these books with my new papers – watch this space to see what they’re like – exciting!!! Well this week was set at a fast moving pace, and I was on the verge of not keeping up with the team! 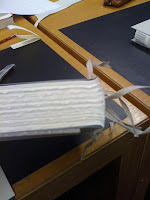 Sadly I didn’t manage to make the headbands for my rounded back (Journey to the Centre of the Earth) in the traditional manner using thread and a leather/vellum core, however I did manage to make them using cord and leather, which you can see stuck on the spine in the picture below – I had rather a lot of difficulty in paring (thinning) the leather, but hopefully I’ll get better with practice … fingers crossed! Following that I had to trim the boards (and then trim them again due to miscalculating), then it was speeding on to lining the spine – so on went the frayknot (this replaced the mull covering the spine that we have previously used), and then the grey kraft paper that you can see in the picture. 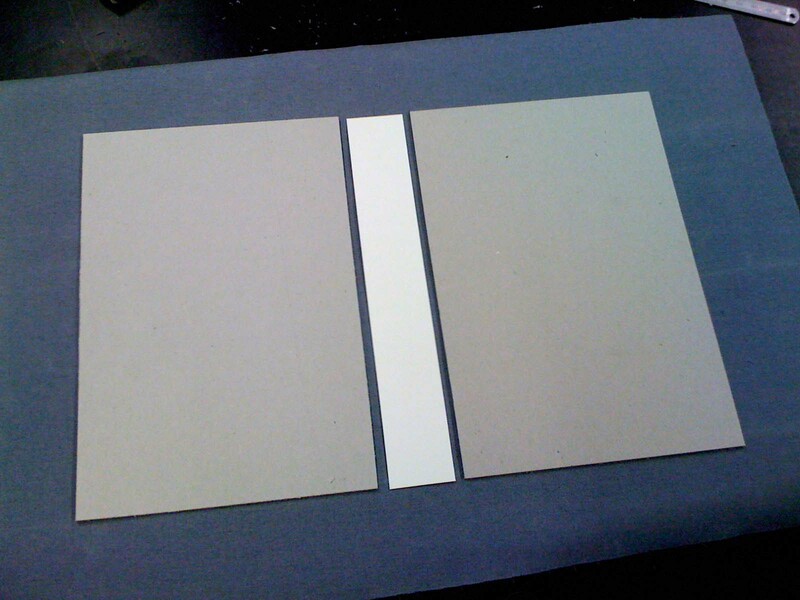 Not content with stopping there, some of us even managed to cover our boards. I had a lucky find in the perfect size and colour of book cloth in the cupboard, but didn’t quite manage to cover it. 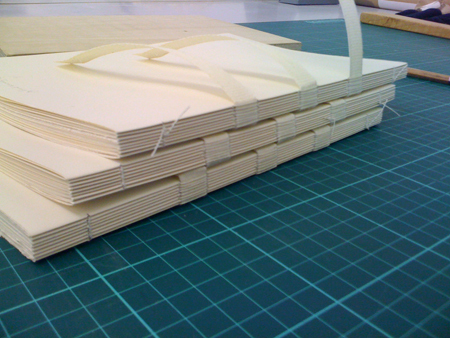 Though I did manage to make the spine piece – this is made from heritage paper rather than board, which is a thick paper, giving support and flexibility to the roundedness of the spine. 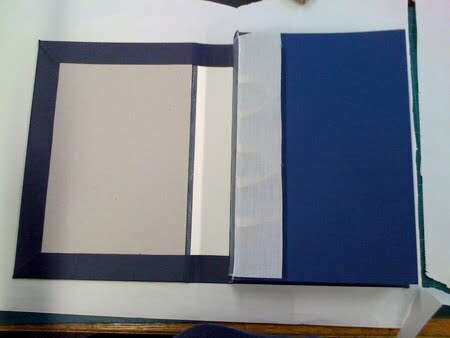 Perfect sized, perfect coloured book cloth!! 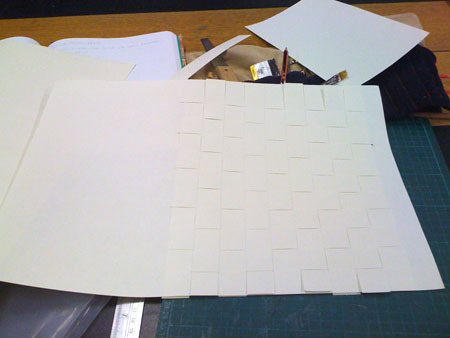 Having contemplated the lack of roundness in my rounded spine book over the last week, I feel I have now come to terms with it and am moving on to the next stage without holding too much resentment for it! 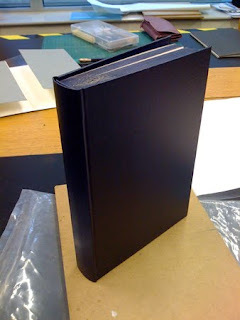 Yesterday I managed to plough the head of my book (the top part of the text block), so it is beautifully smooth and nice looking. 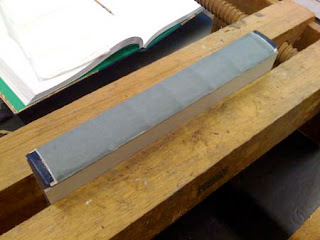 Having ploughed away, I then sanded the same edge whilst the book was clamped in the press in order to get a silky smooth feel. Once sanded I was able to paint it! 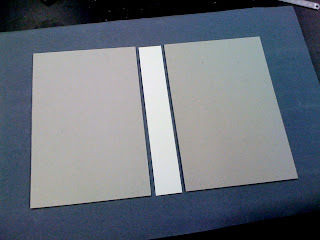 Yes, I have now got a coloured edge to the book, which is EXTREMELY exciting! 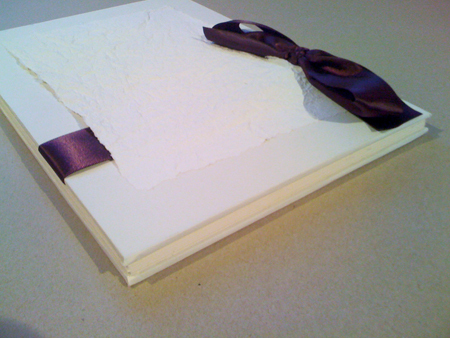 I painted it with acrylic to match the colour of the end papers (the typed coloured pages I sent pictures off a while back). 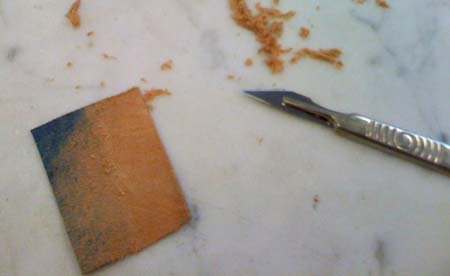 Once the acrylic dried I then polished it with a special ‘Renaissance Polish’ and brushed it down with a shoe brush. 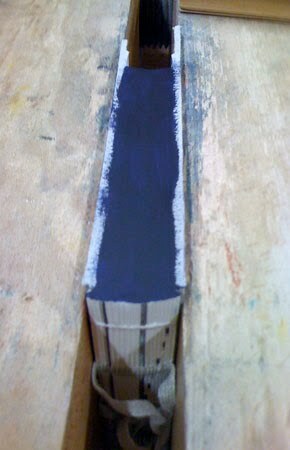 This is what it looked like in the press just after painting. 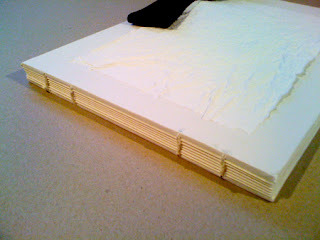 Now it looks amazingly shiny and has a very nice silky smooth feel to it, which I am thoroughly chuffed with! At points over the last few weeks, my skills have dealt me some shoddy hands, leaving me somewhat depressed with my accomplishments. In most cases I am generally worrying a bit too much as I would ideally like these things to be perfect. HOWEVER… this was not the case last night. 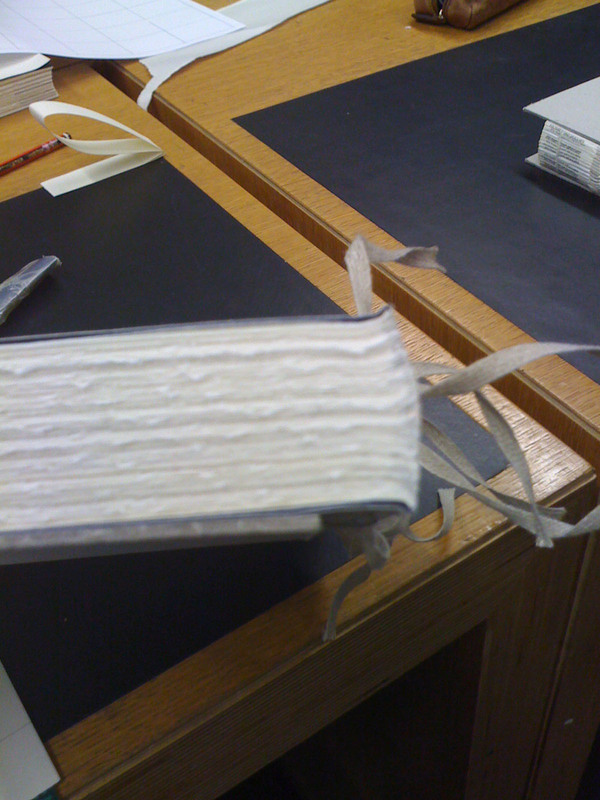 Last night part of my delightful book (Journey to the Centre of the Earth) was ruined. Ruined by me some stages back in the process of making it. Our tutor has told us many times that you must get the sewing right in order to make the book well. This is what I found I had failed on. 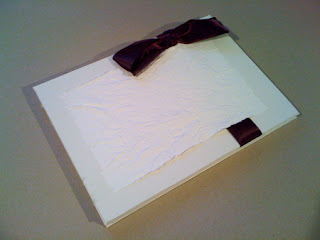 Although my sewing was neat – you may remember the pictures – it was too tight. This meant that when I came to ’round’ it yesterday, there was not enough give or ‘swell’ to allow the book to bend. The rounding is done with a hammer, which is glanced across the spine whilst it is in the press. 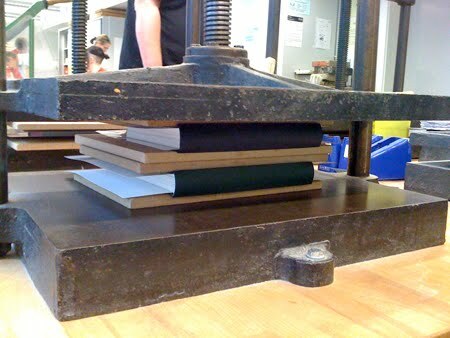 This pushes the spine either side of the center, giving the books its rounded spine. 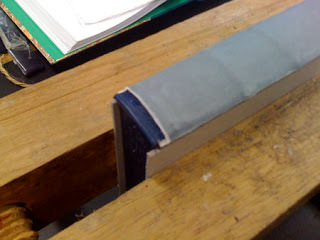 The foredge then also has a curve, which you will see in many old hardback books. 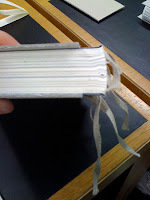 Due to my tight sewing and no swell, my rounded book now remains somewhat flat backed, and is a huge dissapointment to me. On top of this, I also glanced the spine too close to the tail, meaning that I mucked up one of the sections in the middle of the book. You can see in the picture the middle section has buckled. Our tutor saw this as more of a problem than my rounding, but I have to say I am sadder about the latter, as I feel I can improve on the buckling. Well practice makes perfect I suppose. 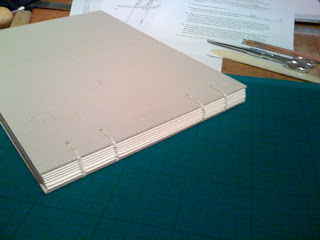 This is a coptic binding sheet I made last night whilst waiting for the press. It will go alonside the spider looking one that I did a long time back.